An explosion and subsequent brief fire rocked an extensive housing project under construction in the Little Tokyo area on Thursday afternoon, sending workers running from the site and lifting clouds of thick black smoke into the air. 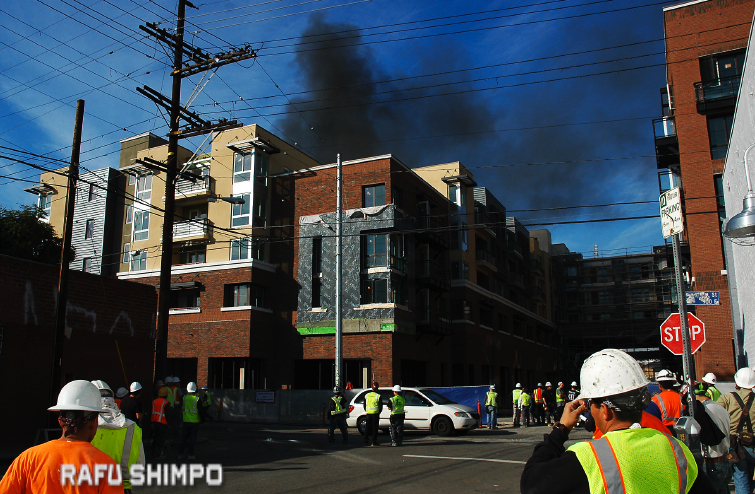 The incident occurred as roofing work was taking place at the six-story project, a sprawling development that occupies most of the area between First and Second streets to the north and south, Vignes and Hewitt to the east and west. A captain by the name of Ponce from the L.A. Fire Department told The Rafu that the explosion, which was felt blocks away, involved propane and a tar pot used in the roofing. More than 70 firefighters responded and no one was injured.